Opening India’s first express quad chair early this year might sound like Gulmarg is going mainstream. The lift was a welcome addition to the gondola, but this powder Shangri-La remains about as different as it gets from typical western ski resorts says Sam Leitch. 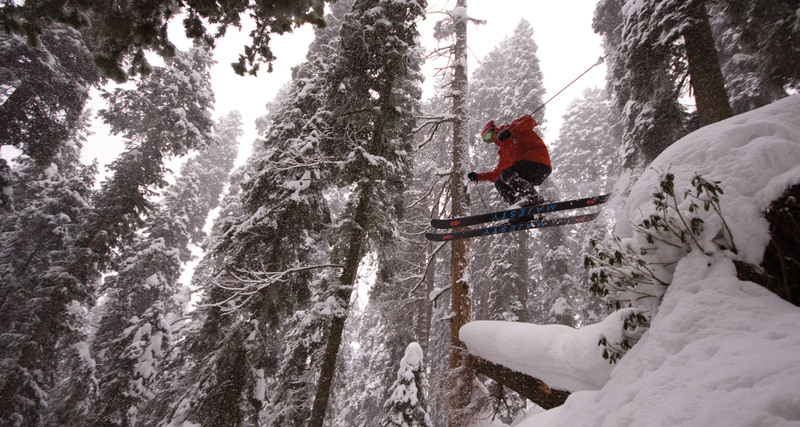 Gulmarg is a ski area unlike anywhere else in the world. A French built Gondola in a sub-range of the Himalayas in Kashmir, India. Its location ensures abundant powder and an exotic culture. And a fair degree of risk due to its size and isolation, as I found out early. “Be careful Sam, don’t just blindly follow people” came the words of advice from Australian guide Bill Barker at the top of the Gondola. It was the second day the top phase had been open in the first three weeks of January. The Gulmarg Snow Safety website recommended skiers should not leave the controlled area. But I’d just met local Kashmiri freeskier Billa Bakshi on the ride up, and he’d offered to show me some turns. He dropped in and I followed at a distance. I watched slightly above and from the side as he traversed fast across the crown at the top of a bowl. The snow pack fractured underneath him as his ski cut triggered a slab avalanche. He kept it pointed sideways and stayed on top of the falling debris until he hit the ridge to the gondola bowl. Shocked and lucky I didn’t take a ride, I traversed to the ridge and skied down though the controlled area. Gulmarg is located in the disputed region of Kashmir in northern India. Mt Apharwat in the Pir Punjal Range faces north east towards the Greater Himalaya, and it’s here you will find the Gulmarg Gondola. Like the great gondolas of France in Chamonix and La Grave, the Gulmarg Gondola offers summer tourists an exhilarating lift four kilometres into the sky. And for freeride skiers and boarders, access to a huge untouched mountain. In the mid-eighties when the Kashmiri Government started construction Bill Barker was a young freeskier. He heard about the Gondola in the Himalayas and decided that as soon as it was finished he would be there to ski bum for a season. Sadly for the Kashmiri people the nineties was a period of war. The Gondola construction was put on hold and tourism stopped. The situation calmed down by the early 2000’s and tourism returned. By winter 2004/2005 the gondola was ready. Bill was second in charge of Mt Hotham ski patrol and an experienced ski mountaineer. Just before leaving Mt Arapiles (a famous rock climbing area in Victoria) with partner and fellow senior patroller Natasha to fly to Kashmir he read an interesting email from some American friends: the state government run Gondola Corporation was gathering a team of international experts to train local Kashmiris in ski patrol and running a ski area. Bill and Natasha became a part of this team and developed strong relationships within the small ski community stoked on their skills and Gulmarg’s future as a ski mecca. Kashmir is now regarded by many as being as safe to travel to as the rest of India. Since the Gondola opened thousands of riders from around the world have visited with no issues. What riders need to respect is that Gulmarg is a very big mountain. As a lift accessed back country ski area your safety depends on yourself and your companions. This January/February I hooked up with Bill and his team of guides to check it out with their expert help. 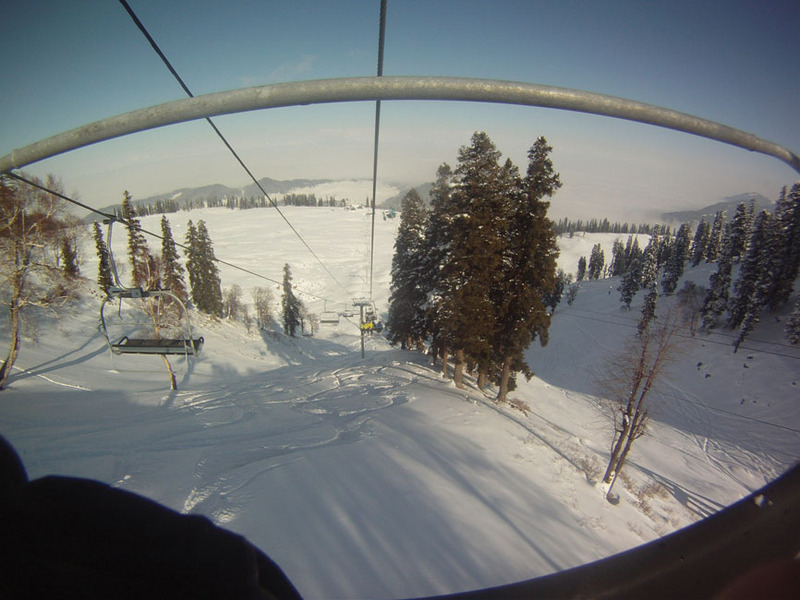 The Gulmarg village is at 2600m, surrounding a summer golf course that doubles as a beginner ski area in winter. From here the first phase of the gondola takes you over gentle undulating terrain through giant pines jumping with snow monkeys to a mid station at 3000 metres. The second phase takes you over the steeper alpine terrain to the shoulder of Apharwat at 4000 metres. Early January was uncrowded and quiet. While there was plenty of snow around, the early season snow pack developed in such a way that meant the steeper upper alpine region accessed by the second phase of the Gondola was avalanche prone and closed. Luckily a new quad chair had just been installed last summer, accessing some of the safer alpine terrain in an area called Mary’s Shoulder. On a bluebird Monday, the 9th of January, we were lucky to be among the thirty or so skiers enjoying the new quad’s debut. With some steep terrain accessible from the quad and a minimal amount of skiers the next few weeks blended into a bluebird haze. Head of Hotham Ski Patrol (and stern speed enforcer) Larry Doyle was touring with Bill and accessing endless powder in the side country. As February approached the unique nature of riding Gulmarg became apparent. With a one metre dump occurring roughly once a week the upper phase of the Gondola could sometimes be closed while patrol grappled with various safety issues. But with the mid station at an altitude of 3000 metres you hardly need it. There are many small villages below with magical names like Babareshi, Drang and Tangmarg. With Bill’s local knowledge we could ski untracked powder down through the giant pines and then drink tea with the beautiful Kashmiri families. And when the upper phase was open and safe these descents turned into 2000 vertical metres of untracked powder. The snow quality was always best on the north faces and in the trees, and the guides made sure that’s where we stayed. We also hiked past the summit of Apharwat and descended through alpine bowls and then paper tree’s to below the sprawling Army Camp. There is also a new heliski operation in town which Bill’s Trips used to grab a one way ride to nearby Mt Sunshine. The crew then toured back joined by curious local kids intent on trying the girls’ snowboards along the traverse. Gulmarg is definitely a great place for intermediate level and above riders to dial in their powder skills. The food is delicious, spicy and cheap. And learning that the Kashmiris are such warm, friendly, hospitable and extremely funny people is an extra reward. A glimpse into their life is an education. Open minded visitors with the inclination and equipment for touring will be gifted with deep powder turns and the friendship of the locals. Every Tuesday night Brian Newman from Gulmarg Snow Safety hosts an avalanche safety awareness talk at Hotel Pine Palace explaining the nature of the resort and current conditions for the benefit of any newcomers. Afterwards the night degenerates into a smoky disco party with possibly a dance off between Bill Barker and Billa Bakshi. Kashmir is predominantly Muslim, with locals preferring hash to alcohol, however Gulmarg has adapted to western influences with fearsome spirits and beer containing glycol available at most restaurants. Try Alpine Ridge for a wild Russian ‘beach party’, or step back in time at stately Hotel Highlands Park with immaculately uniformed waiters, bears and leopard skins on the walls, and traditional kashmiri folk music performed by veiled men dancing as ladies. Richard Neville at SnowMonkey Ski & Snowboard Shop for the sweet backcountry equipment and avalanche rescue kit. Bill Barker & Bills Trips guides Sam Dunlop, Mark Brown & David Marchi for the fun adventure. local knowledge avalanche is an ever present danger here (slides have been tracked finishing over 10km from their start point), and the available terrain is big, so signing up with a guide is the smart way to go; Bill Barker’s Bills Trips crew are generally recognised as the best available. Best place to stay is the Hotel Highlands Park.